This article written 9 years ago discusses the evolution of the Middle East War. The US-NATO design involves a timeline of military interventions. The ongoing wars on Syria, Iraq and Yemen are part of a military roadmap which is ultimately directed against Iran. The aerial bombing plans have been fully operational (“in an advanced state of readiness”) since June 2005. The various components of the military operation are firmly under US Command, coordinated by the Pentagon and US Strategic Command Headquarters (USSTRATCOM) at the Offutt Air Force base in Nebraska. Today, US-NATO in liaison with Israel are waging a broader war in the Middle East while also deploying troops and military hardware in East Europe on the border with Russia. The issue is not whether the war will inevitably take place but what are the instruments at our disposal which will enable us to shunt and ultimately disarm this global military agenda. What is required is a grass roots antiwar network, a mass movement at national and international levels, which challenges the legitimacy of the main military and political actors, as well as their corporate sponsors, and which would ultimately be instrumental in unseating those who rule in our name. Israel’s war on Lebanon is an integral part of a US sponsored “military roadmap”. The war on Lebanon, which has resulted in countless atrocities including the destruction of the nation’s economy and civilian infrastructure, is “a stage” in a sequence of carefully planned military operations. Lebanon constitutes a strategic corridor between Israel and North-western Syria. The underlying objective of this war was the militarization of Lebanon, including the stationing of foreign troops, as a precondition for carrying out the next phase of a broader military agenda. Formally under a UN mandate, the foreign troops to be stationed on Lebanese soil on the immediate border with Syria, will be largely although not exclusively from NATO countries. This military force mandated by the UN Security Council is by no means neutral. It responds directly to US and Israeli interests. Moreover, the timely withdrawal of Syrian troops, following the February 2005 assassination of former Prime Minister Rafik Hariri has contributed to opening up a “new space”. The withdrawal of Syrian troops served Israeli interests. The timely pullout was of strategic significance: it was a major factor in the timing and planning of the July 2006 IDF attacks on Lebanon. In the aftermath of the Israeli bombings and the “ceasefire”, UN Security Council Resolution 1701, drafted by France and the US in close consultation with the Israeli government, has paved the way for the militarization of Lebanon, under a bogus UN mandate. Confirmed by official statements and military documents, the US in close coordination with Britain (and in consultation with its NATO partners), is planning to launch a war directed against Iran and Syria. US Ambassador to the UN John Bolton has already initiated the draft of a UN Security Council resolution with a view to imposing sanctions on Tehran for its alleged (nonexistent) nuclear weapons program. Whether this resolution is adopted is not the main issue. The US may decide to proceed in defiance of the Security Council, following a veto by Russia and/or China. The vote of France and Britain, among the permanent members has already been secured. American air strikes on Iran would vastly exceed the scope of the 1981 Israeli attack on the Osiraq nuclear center in Iraq, and would more resemble the opening days of the 2003 air campaign against Iraq. Using the full force of operational B-2 stealth bombers, staging from Diego Garcia or flying direct from the United States, possibly supplemented by F-117 stealth fighters staging from al Udeid in Qatar or some other location in theater, the two-dozen suspect nuclear sites would be targeted. In November 2004, US Strategic Command conducted a major exercise of a “global strike plan” entitled “Global Lightening”. The latter involved a simulated attack using both conventional and nuclear weapons against a “fictitious enemy” [Iran]. Following the “Global Lightening” exercise, US Strategic Command declared “an advanced state of readiness”. The command structure of the operation is centralized and ultimately The Pentagon will decide on the sequence; ” if and when” to launch military operations against Iran and Syria. Israeli military actions and those of other coalition partners including Turkey, would be carried out in close coordination with the Pentagon. While the threat of punitive aerial bombardments of Iran’s nuclear facilities have been announced repeatedly by the Bush administration, recent developments suggest that an all out ground war is also under preparation. CONPLAN constitutes only one component of the Middle East military agenda. CONPLAN 8022 does not contemplate a ground war. It posits “no boots on the ground”, which was the initial assumption envisaged in relation to the proposed aerial attacks on Iran. US and Israeli military planners are fully aware that the aerial “punitive bombings” will almost inevitably lead coalition forces into a ground war scenario in which they will have to confront Iranian and Syrian forces in the battlefield. Tehran has confirmed that it will retaliate if attacked, in the form of ballistic missile strikes directed against Israel as well as against US military facilities in Iraq, Afghanistan and the Persian Gulf, which would immediately lead us into a scenario of military escalation and all out war. Iranian troops could cross the Iran-Iraq border and confront coalition forces inside Iraq. Israeli troops and/or Special Forces could enter into Syria. The foreign troops stationed in Lebanon under UN mandate would respond to the diktats of the US led coalition and the prior commitments reached with Washington and Tel Aviv in the context of the various military alliances (NATO-Israel, Turkey-Israel, GUUAM, etc). These military preparations have also been marked, quite recently, by the conduct of war games. Iran War Games August 2006. Barely acknowledged by the Western media, military exercises organized by Russia, Kazakhstan, Kyrgyzstan and Tajikistan under the Collective Security Treaty Organization, (CSTO) were also launched in late August. These war games, officially tagged as part of a counter terrorism program, were conducted in response to US-Israeli military threats in the region including the planned attacks against Iran. (See Michel Chossudovsky, August 2006). In turn, China an Kazakhstan held concurrent war games under the auspices of the Shanghai Cooperation Organization (SCO). Azerbaijan and neighboring Georgia have close military ties to Washington. Both countries are part of GUUAM, a military alliance with the US and NATO. Turkey is a close ally of Israel. Since 2005, Israel has deployed Special Forces in the mountainous areas of Turkey bordering Iran and Syria with the collaboration of the Ankara government: Pakistan is also a close ally of the US and Britain. Georgia also has a military cooperation agreement with Israel. Meanwhile, the USS Enterprise, America’s largest aircraft carrier is en route to the Persian Gulf. Map; Copyright Eric Waddell, Global Research 2003. Click to enlarge. The Pentagon justifies the troop build-up as part of a “routine” process of replacement and rotation, required in its ongoing war against “terrorists” in Iraq. The speeding up of military recruitment is also occurring in the core countries of the Anglo-American coalition including Great Britain. Australia and Canada (see also Recruiting Canada). Canada and Australia are aligned with the US. Australian Prime Minister John Howard as well as Canada’s Steven Harper have confirmed their commitment to the US-Israeli war and have promised an expansion of the armed forces in their respective countries. Meanwhile British troops stationed in Iraq have been redeployed to the Iranian border in southern Iraq. This redeployment has been casually presented by Britain’s Ambassador to Iraq as part of a “crack down on smuggling and the entrance of weapons into Iraq from Iran”. The Western media is beating the drums of war. The fact that Iran does not possess nuclear weapons capabilities as confirmed by the IAEA report does not seem to be an issue for debate. Media disinformation has contributed to creating an atmosphere of fear and intimidation. The announcement on August 10 by the British Home Office of a foiled large scale terror attack to simultaneously blow up as many as ten airplanes, conveys the impression that it is the Western World rather than the Middle East which is under attack. Realities are twisted upside down. The disinformation campaign has gone into full gear. The British and US media are increasingly pointing towards “preemptive war” as an act of “self defense” against Al Qaeda and the State sponsors of terrorism, who are allegedly preparing a Second 911. The underlying objective, through fear and intimidation, is ultimately to build public acceptance for the next stage of the Middle East “war on terrorism” which is directed against Syria and Iran. The antiwar movement has also been weakened. While China and Russia will oppose the US led war at the diplomatic level as well as at the UN Security Council, Washington has secured the support of France and Germany. While Russia and China have military cooperation agreements with Iran, they would most probably not intervene militarily in favor of Iran. NATO is broadly supportive of the US led military agenda. In February 2005, NATO signed a military cooperation agreement with Israel. The use of tactical nuclear weapons by the US and Israel against Iran, is contemplated, ironically in retaliation for Iran’s nonexistent nuclear weapons program. The Bush administration’s new nuclear doctrine contains specific “guidelines” which allow for “preemptive” nuclear strikes against “rogue enemies” which “possess” or are “developing” weapons of mass destruction (WMD). (2001 Nuclear Posture Review (NPR) and Doctrine for Joint Nuclear Operations (DJNO)). The mission of JFCCSGS is to implement CONPLAN 8022, in other words to trigger a nuclear war with Iran. The Commander in Chief, namely George W. Bush would instruct the Secretary of Defense, who would then instruct the Joint Chiefs of staff to activate CONPLAN 8022. The use of nuclear weapons against Iran would be coordinated with Israel, which possesses a sophisticated nuclear arsenal. 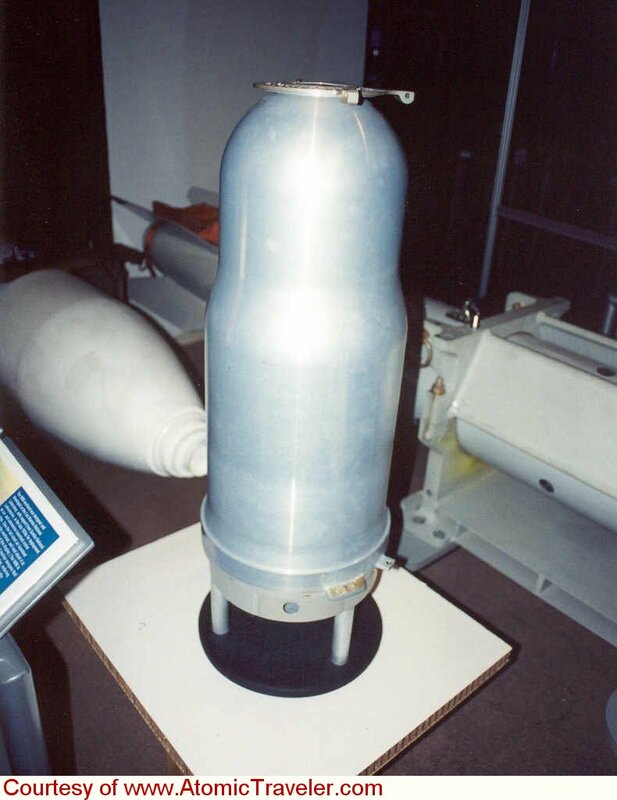 The use of nuclear weapons by Israel or the US cannot be excluded, particularly in view of the fact that tactical nuclear weapons have now been reclassified as a variant of the conventional bunker buster bombs and are authorized for use in conventional war theaters. (“they are harmless to civilians because the explosion is underground”). In this regard, Israel and the US rather than Iran constitute a nuclear threat. The Bush Administration has embarked upon a military adventure which threatens the future of humanity. This is not an overstatement. If aerial bombardments were to be launched against Iran, they would trigger a ground war and the escalation of the conflict to a much broader region. Even in the case of aerial and missile attacks using conventional warheads, the bombings would unleash a “Chernobyl type” nuclear nightmare resulting from the spread of nuclear radiation following the destruction of Iran’s nuclear energy facilities. Throughout history, the structure of military alliances has played a crucial role in triggering major military conflicts. In contrast to the situation prevailing prior to the 2003 invasion of Iraq, America’s ongoing military adventure is now firmly supported by the Franco-German alliance. Moreover, Israel is slated to play a direct role in this military operation. NATO is firmly aligned with the Anglo-American-Israeli military axis, which also includes Australia and Canada. In 2005, NATO signed a military cooperation agreement with Israel, and Israel has a longstanding bilateral military agreement with Turkey. Iran has observer status in The Shanghai Cooperation Organization (SCO) and is slated to become a full member of SCO. China and Russia have far-reaching military cooperation agreements with Iran. China and Russia are firmly opposed to a US-led military operation in the diplomatic arena. While the US sponsored military plan threatens Russian and Chinese interests in Central Asia and the Caspian sea basin, it is unlikely that they would intervene militarily on the side of Iran or Syria. The planned attack on Iran must be understood in relation to the existing active war theaters in the Middle East, namely Afghanistan, Iraq and Lebanon-Palestine. The conflict could easily spread from the Middle East to the Caspian sea basin. It could also involve the participation of Azerbaijan and Georgia, where US troops are stationed. Military action against Iran and Syria would directly involve Israel’s participation, which in turn would trigger a broader war throughout the Middle East, not to mention the further implosion in the Palestinian occupied territories. Turkey is closely associated with the proposed aerial attacks. In turn the US sponsored aerial bombardments directed against Iran could contribute to triggering a ground war characterized by Iranian attacks directed against coalition troops in Iraq. In turn, Israeli forces would enter into Syria. An attack on Iran would have a direct impact on the resistance movement inside Iraq. It would also put pressure on America’s overstretched military capabilities and resources in both the Iraqi and Afghan war theaters. In other words, the shaky geopolitics of the Central Asia- Middle East region, the three existing war theaters in which America is currently, involved, the direct participation of Israel and Turkey, the structure of US sponsored military alliances, etc. raises the specter of a broader conflict. 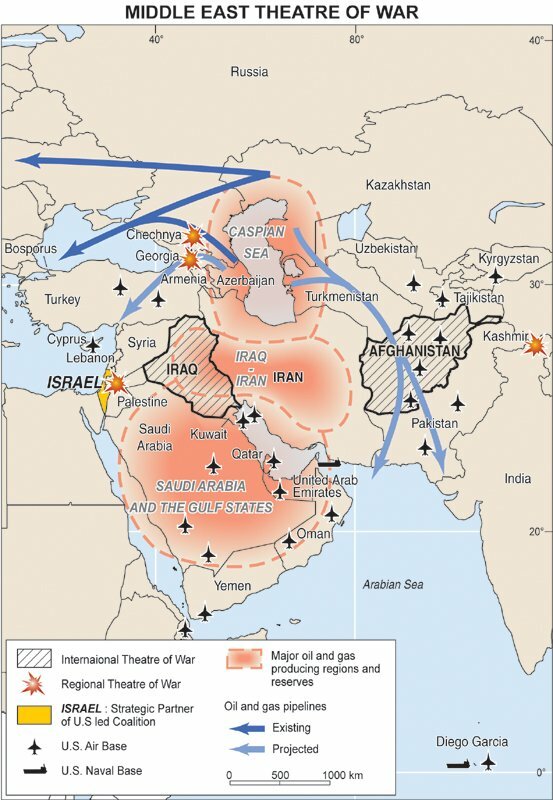 The war against Iran is part of a longer term US military agenda which seeks to militarize the entire Caspian sea basin, eventually leading to the destabilization and conquest of the Russian Federation. The economic and political dislocations resulting from this military agenda are far-reaching. If the attacks directed against Iran and Syria were to proceed, martial law and/or a state of emergency could be declared in the US and possibly Britain on the pretext that the homeland is under attack by Iran sponsored terrorists. The purpose of these measures would essentially be to curb the antiwar movement and provide legitimacy to an illegal war. The Pentagon has intimated in this regard, in an official statement, that “another [9/11] attack could create both a justification and an opportunity to retaliate against some known targets [Iran and Syria]”. In a timely statement, barely a few days following the onslaught of the bombing of Lebanon, Vice President Cheney reiterated his warning: “The enemy that struck on 9/11 is fractured and weakened, yet still lethal, still determined to hit us again” (Waterloo Courier, Iowa, 19 July 2006, italics added). b) military plans to launch an attack on Iran and Syria are “in an advanced stage of readiness”. War is not an inevitable process. War can be prevented through mass action. The issue is not whether the war will inevitably take place but what are the instruments at our disposal which will enable us to shunt and ultimately disarm this global military agenda. War criminals occupy positions of authority. The citizenry is galvanized into supporting the rulers, who are “committed to their safety and well-being”. Through media disinformation, war is given a humanitarian mandate. The legitimacy of the war must be addressed. Antiwar sentiment alone does not disarm a military agenda. High ranking officials of the Bush administration, members of the military and the US Congress have been granted the authority to uphold an illegal war. The corporate backers and sponsors of war and war crimes must also be targeted including the oil companies, the defense contractors, the financial institutions and the corporate media, which has become an integral part of the war propaganda machine. 1. The role of media disinformation in sustaining the military agenda is crucial. We will not succeed in our endeavours unless the propaganda apparatus is weakened and eventually dismantled. It is essential to inform our fellow citizens on the causes and consequences of the US-led war, not to mention the extensive war crimes and atrocities which are routinely obfuscated by the media. This is no easy task. It requires an effective counter-propaganda program which refutes mainstream media assertions. It is essential that the relevant information and analysis reaches the broader public. The Western media is controlled by a handful of powerful business syndicates. The media conglomerates which control network TV and the printed press must be challenged through cohesive actions which reveal the lies and falsehoods. 2. There is opposition within the political establishment in the US as well as within the ranks of the Armed Forces. While this opposition does not necessarily question to overall direction of US foreign policy, it is firmly opposed to military adventurism, including the use of nuclear weapons. These voices within the institutions of the State, the Military and the business establishment are important because they can be usefully channeled to discredit and ultimately dismantle the “war on terrorism” consensus. The broadest possible alliance of political and social forces is, therefore, required to prevent a military adventure which in a very real sense threatens the future of humanity. 3. The structure of military alliances must be addressed. A timely shift in military alliances could potentially reverse the course of history. Whereas France and Germany are broadly supportive of the US led war, there are strong voices in both countries as well as within the European Union, which firmly oppose the US led military agenda, both at the grassroots level as well within the political system itself. It is essential that the commitments made by European heads of government and heads of State to Washington be cancelled or nullified, through pressure exerted at the appropriate political levels. This applies, in particular, to the unbending support of the Bush adminstration, expressed by President Jacques Chirac and Chancellor Angela Merkel. The weakening of the system of alliances which commits Western Europe to supporting the Anglo-American military axis, could indeed contribute to reversing the tide. Washington would hesitate to wage a war on Iran without the support of France and Germany. 4. The holding of large antiwar rallies is important and essential. But in will not in itself reverse the tide of war unless it is accompanied by the development of a cohesive antiwar network. What is required is a grass roots antiwar network, a mass movement at national and international levels, which challenges the legitimacy of the main military and political actors, as well as their corporate sponsors, and which would ultimately be instrumental in unseating those who rule in our name. The construction of this type of network will take time to develop. Initially, it should focus on developing an antiwar stance within existing citizens’ organizations (e.g. trade unions, community organizations, professional regroupings, student federations, municipal councils, etc.). 5. 9/11 plays a crucial and central role in the propaganda campaign. The threat of an Al Qaeda “Attack on America” is being used profusely by the Bush administration and its indefectible British ally to galvanize public opinion in support of a global military agenda. Revealing the lies behind 911 would serve to undermine the legitimacy of the “war on terrorism”. Without 911, the war criminals in high office do not have a leg to stand on. The entire national security construct collapses like a deck of cards. Known and documented, the “Islamic terror network” is a creation of the US intelligence apparatus. Several of the terror alerts were based on fake intelligence as revealed in the recent foiled “liquid bomb attack”. There is evidence that the several of the terrorist “mass casualty events” which have resulted in civilian casualties were triggered by the military and/or intelligence services. (e.g Bali 2002). The “war on terrorism” is bogus. The 911 narrative as conveyed by the 911 Commission report is fabricated. The Bush administration is involved in acts of cover-up and complicity at the highest levels of government. Michel Chossudovsky is the author of the international best seller “The Globalization of Poverty “ published in eleven languages. He is Professor of Economics at the University of Ottawa and Director of the Center for Research on Globalization. His most recent book is America’s “War on Terrorism”, Global Research, 2005. Note: Readers are welcome to cross-post this article with a view to spreading the word and warning people of the dangers of a broader Middle East war. Please indicate the source and copyright note.